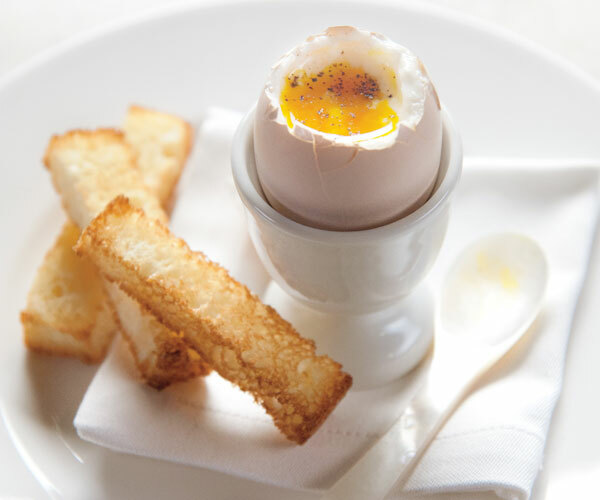 Want to know how to cook the perfect soft- or hard-cooked egg? Or the fluffiest scramble? Martha shares these and other secrets as she teaches viewers all they need to know about eggs, the world’s most versatile protein. Whether you like your egg over easy or sunny-side up, Martha shows you how to prepare them properly every time, with easy-to-master techniques and tips. You’ll learn a clever method for frying eggs, a surefire omelet recipe, and the key to a foolproof frittata. Martha Stewart demonstrates the best way to peel hard boiled eggs. She also explain how an egg’s age impacts the peeling process. Martha Stewart makes this frittata recipe with fingerling potatoes for breakfast on the "Eggs" episode of "Martha Stewart's Cooking School." Heat 1 tablespoon olive oil in a 10-inch nonstick skillet over medium heat. Cook onion until soft and translucent, stirring occasionally, 3 to 4 minutes. Remove onions and add remaining tablespoon olive oil and 2 tablespoons butter. Add potatoes and season with salt and pepper. Saute until they begin to turn golden brown, about 4 minutes. Return onions to skillet in an even layer. Sprinkle evenly with basil and parsley. Heat broiler. Use a whisk to lightly beat eggs in a large bowl, then whisk in cream, and season with 1/2 teaspoon salt and 1/8 teaspoon pepper. Pour egg mixture into skillet. Cook, using a heatproof flexible spatula to stir and push egg from edges to center of pan so runny parts run underneath, until eggs are almost set (they should still be wet on top but otherwise set throughout), 2 to 3 minutes. Drop dollops of goat cheese on top of frittata, distributing evenly and pressing down into eggs a bit with the spatula. Sprinkle evenly with Parmigiano-Reggiano cheese. Broil until frittata is set on top and has puffed slightly, and cheese is melted and golden, 1 to 1 1/2 minutes. Gently run the spatula around the edges and underneath the frittata and carefully slide out of pan onto a plate. Slice into six wedges and serve hot, warm, or at room temperature. This frittata recipe appears in the "Eggs" episode of "Martha Stewart's Cooking School." Visit the episode guide to watch a preview and get a cooking tip.